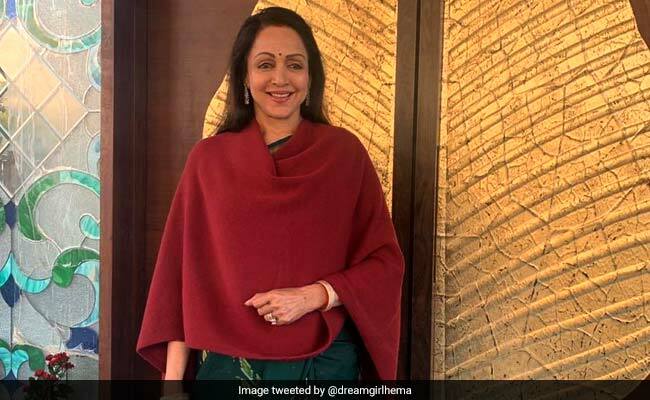 Hema Malini on Thursday thanked Prime Minister Narendra Modi and BJP president Amit Shah for choosing her to contest from Mathura. BJP leader Hema Malini will contest the April-May general election from Mathura, her current parliamentary constituency. The BJP on Thursday released the list of candidates for 184 constituencies across the country. While there were many surprises, Ms Malini's candidature was on expected lines as she had said earlier this year that she had got the "green signal from higher-ups". The actor-turned-politician on Thursday thanked Prime Minister Narendra Modi and BJP president Amit Shah for choosing her to contest from Mathura. She promised to work hard for the development of the area. "People wanted me to contest from here again, I am thankful to Amit Shah ji and Modi ji for choosing me again. I will work hard and bring development to the area," she told news agency ANI. In neighbouring Agra, the party decided to replace both the sitting lawmakers. In Agra city, Uttar Pradesh Minister SP Singh Baghael replaces Ram Shankar Katheria, Chairman of the SC/ST Commission, while in Fatehpur Sikri, Raj Kumar Chahar will contest instead of Choudhary Babu Lal. The BJP's first list confirmed that PM Modi would contest from his Lok Sabha constituency Varanasi. BJP president Amit Shah will fight from Gandhinagar in his home town Gujarat; a seat where BJP veteran LK Advani is the sitting lawmaker. Mr Advani is not on the first list of candidates. Union minister Smriti Irani will take on Congress president Rahul Gandhi for the second time, as she contests from Amethi. Minister VK Singh will fight from Ghaziabad. Babul Supriyo will contest from current seat Asansol.